Yes, this tape actually exists somewhere. I clearly remember one night at 23 Hop in late November the holes in the DJ booth were completely covered up. The interior of the booth was glowing so I peeked in when the door opened and saw a video shoot in progress – filming The Booming System in action. I asked someone what was going on inside and learned it was a project by some film students. It wasn’t until around 1995 that I asked about it again, the event was then confirmed by the Exodus crew during our interview with them. However, I never got a straight answer as to who shot it or the whereabouts of the tape and the lack of specifics has continued in recent communications. After exhausting every possible lead I even tried contacted Ryerson Alumni to see if I could track down the students who shot the footage. No luck. They may not even be from Ryerson, that was just an assumption – could be Sheridan or elsewhere. If anyone stumbles across this and can provide any assistance please contact us. There was also an amateur hand held footage taken at Exodus that I viewed in 1992 at X-Static. It was pretty rough and hard to make out, but it could be the only footage in existence. We’ve been in contact with the person who shot it and he’s optimistic about still having it somewhere, but has no clue where to begin looking. 12/03/2010 – After receiving the comment (below) we were tipped off that the footage might have been used in an indie Toronto documentary called Digital Dance Nation. I was at Suspect video an hour later and looked through their music documentary section. The VHS wasn’t there, however, it did appear on their system as being rented four years ago by the gentleman who commented below. Other than that they had absolutely no information about what happened to the tape – it has mysteriously vanished. But at least we now have a name. If you are in possession of this tape or happen to be one of the people involved in producing it please contact us. We’re now offering a $200 reward for a copy of this tape on VHS. He was also nice enough to have the tape converted and declined the reward. This is an awesome little flick, lots of cool cameos – an epic flashback. This entry was posted on Monday, November 30th, 2009 at 8:12 pm	and is filed under 1991. You can follow any responses to this entry through the RSS 2.0 feed. You can leave a response, or trackback from your own site. 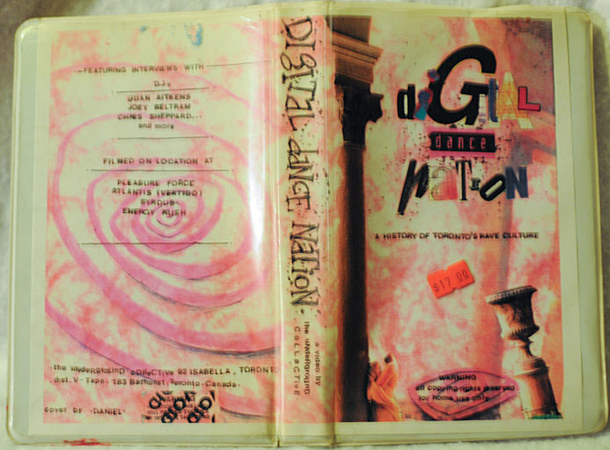 Have you seen the video ‘Digital Dance Nation’? It was a small documentary about the early rave-scene in Toronto and I’m almost positive it was put together by Ryerson students. Suspect Video on Markham Street has a copy. I think about renting it and ripping it to post from time to time. If I remember correctly there are credits at the end which should allow you to make searches on Facebook and the like. There are a fair number of clips shot at early parties in it. This might be the video you are thinking of. Oh crazy! You found it! Ha ha. Amazing. I knew it would turn up.